Just noticed this – if you look at the Wikipedia entry for the A-12 Oxcart – predecessor to the SR-17 Blackbird you will see that it says the original test pilot was Bissell and the test pilot of the first SR-17 was a Gilliland in 1964. Now if you are as familiar with the 1964 film 633 Squadron as I am (see my Questionnaire for Cliff Robertson – Cliff’s Response blog for 24 November 2010) you will know very well that Roy Grant’s navigator for one mission is a Bissell and that another pilot is called Gillibrand. Could this be coincidence? It seems even less likely when you realise that the director Walter Grauman was a combat crewman in a B-25 during WWII and mad-keen on aircraft. I wonder if he knew all about the Oxcart programme even then? 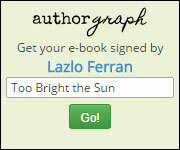 I am continuing with the final edit and spell-check of Too Bright the Sun so that I can publish in July. * 16 August 1956: Following Soviet protest of U-2 overflights, Richard M. Bissell, Jr. conducts the first meeting on reducing the radar cross section of the U-2. This evolves into Project Rainbow. * December 1957: Lockheed begins designing subsonic stealthy aircraft under what will become Project Gusto. * 24 December 1957: First J-58 engine run. * 21 April 1958: Kelly Johnson makes first notes on a Mach 3 aircraft, initially called the U-3, but eventually evolving into Archangel I. * November 1958: The Land panel provisionally selects Convair Fish (B-58-launched parasite) over Lockheed’s A-3. * June 1959: The Land panel provisionally selects Lockheed A-11 over Convair Fish. Both companies instructed to re-design their aircraft. * 14 September 1959: CIA awards antiradar study, aerodynamic structural tests, and engineering designs, selecting Lockheed’s A-12 over rival Convair’s Kingfish. Project Oxcart established. * 26 January 1960: CIA orders 12 A-12 aircraft. * 1 May 1960: Francis Gary Powers is shot down in a U-2 over the Soviet Union. * 26 April 1962: First flight of A-12 with Lockheed test pilot Louis Schalk at Groom Lake. * 13 June 1962: SR-71 mock-up reviewed by USAF. * 30 July 1962: J58 engine completes pre-flight testing. * 28 December 1962: Lockheed signs contract to build six SR-71 aircraft. * 7 August 1963: First flight of the YF-12A with Lockheed test pilot James Eastham at Groom Lake. * June 1964: Last production A-12 delivered to Groom Lake. * 25 July 1964: President Johnson makes public announcement of SR-71. * 29 October 1964: SR-71 prototype (#61-7950) delivered to Palmdale. * 22 December 1964: First flight of the SR-71 with Lockheed test pilot Bob Gilliland at AF Plant #42. First mated flight of the MD-21 with Lockheed test pilot Bill Park at Groom Lake. * 28 December 1966: Decision to terminate A-12 program by June 1968. * 3 November 1967: A-12 and SR-71 conduct a reconnaissance fly-off. Results were questionable. * 5 February 1968: Lockheed ordered to destroy A-12, YF-12 and SR-71 tooling. * 8 March 1968: First SR-71A (#61-7978) arrives at Kadena AB (OL 8) to replace A-12s. * 21 March 1968: First SR-71 (#61-7976) operational mission flown from Kadena AB over Vietnam. * 8 May 1968: Jack Layton flies last operational A-12 sortie, over North Korea. * 21 June 1968: Final A-12 flight to Palmdale, California. Update: Well, I am going to have to debunk my own theory: I did some research and 633 Squadron was first published in 1956 so it couldn’t have borrowed names from the Oxcart/Blackbird programme. Strange coincidence though.